Heavenly Father, thank you for your sacrifice for our sins. Thank you for your sustaining presence in our universe. Thank you for your every day intercession. Thank you for being God-for-me at the Father's side. To the glorious, majestic and holy God, who sent Jesus as Savior, be glory, honor, and adoration forever and ever. Amen. 7Do not marvel that I said to you, `You must be born anew.' 8 The wind blows where it wills, and you hear the sound of it, but you do not know whence it comes or whither it goes; so it is with every one who is born of the Spirit." 9 Nicode'mus said to him, "How can this be? "10 Jesus answered him, "Are you a teacher of Israel, and yet you do not understand this? 11 Truly, truly, I say to you, we speak of what we know, and bear witness to what we have seen; but you do not receive our testimony. 12 If I have told you earthly things and you do not believe, how can you believe if I tell you heavenly things? 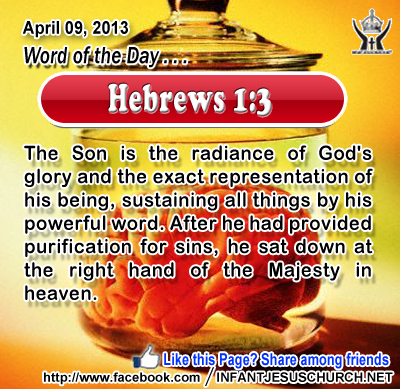 13 No one has ascended into heaven but he who descended from heaven, the Son of man. 14 And as Moses lifted up the serpent in the wilderness, so must the Son of man be lifted up, 15 that whoever believes in him may have eternal life." Jesus spoke to Nicodemus of a "new birth in the Spirit" which would come concerning through the victory he would achieve through his death and rising. The Hebrew word for "spirit" means both "wind" and "breath". Jesus said to Nicodemus: "You can hear, feel, and see the results of the wind, but you do not know where it comes from. In like manner, you can see the results of the Holy Spirit in the lives of those the Spirit touches." Jesus clarifies to Nicodemus the necessity of the crucifixion, his atoning death on the cross, and the resurrection, his rising from the tomb on the third day, by similarity with Moses lifting up the bronze serpent in the desert which brought healing and liberation from the curse of death. When the people of Israel were afflicted with serpents in the wilderness since of their sin, God instructed Moses: "Make a fiery serpent, and set it on a pole; and everyone who is bitten, when he sees it, shall live". Loving infant Jesus, your death brought life for us. Fill us with your Holy Spirit that we may walk in freedom and joy in the knowledge of your great victory over sin and death.